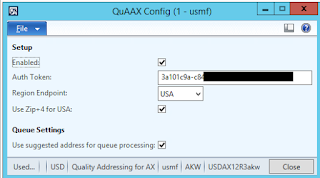 I wanted to talk about a new product for address validation and discovery in AX called QuAAX (Quality Addressing for AX), powered by Experian Data Quality. It's more than a simple "is this address valid or not" type of program and allows for address discovery, quick entry, and some fuzzy operations. It also works internationally with 200+ countries supported. Disclaimer: I worked on this product. Addresses in AX can be a headache. Between data migrations from years of different systems, order imports from external sources, and user entry error you can end up with a mess of postal address records that you have varying degrees of confidence in. This is where QuAAX can help solve many of those issues. The code is almost entirely X++ and lives in AX, which makes desired customization easy and provides transparency. It's designed to be an easy install via model file with a few overlayered objects to merge. It is powered by Experian Data Quality web services, so for the configuration you simply put in your Auth Token and set a few minor settings. This means you don't need to update any on-premise software. 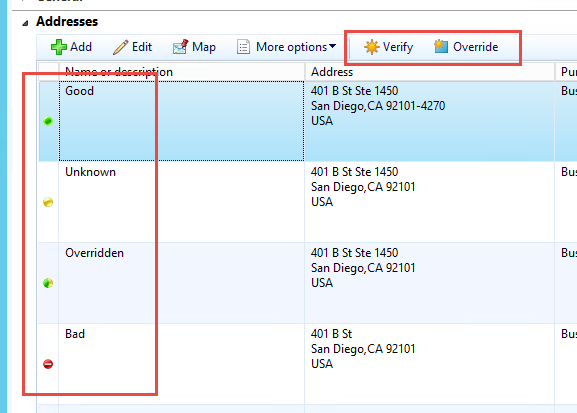 It also back-fills related tables, so no need to create new zip-codes and it can automatically complete zip+4 codes. There is a new indicator on the address records throughout the system that visually indicates the status of the address and shortcut buttons to verify addresses. It will automatically create suggestions for validated addresses that are more well formatted. When you have an address that is close to correct, it will automatically jump into the edit view with the parts it was able to verify and ask for user input. An example is this address (401 B St, San Diego, CA 92101) where I forgot to enter the suite #. It prompts me to enter it and provides acceptable ranges of input. There is a fancy engine used for keying in new addresses that lets you very quickly enter data and also suggests inputs as you type. It also has a bulk processing engine and simple API, so you can perform cleanup on your legacy data or perform validation calls on new addresses input from external sources. Some final comments. 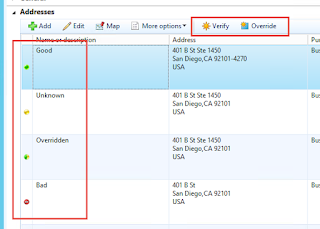 Right now it's supported for AX 2012 and it's coming soon to Dynamics 365 for Operations. There are plenty more features I wasn't able to cover in this post such as lat/long, address type indicator (residential vs commercial), and more.